Good morning and Happy New Year to everyone! Have you had a chance to check out the new PageMaps and CardMaps sketches and samples that posted this morning on the main site? The very talented design team at Scraptastic created the page samples, and many of my talented friends at Flourishes made some beautiful cards! 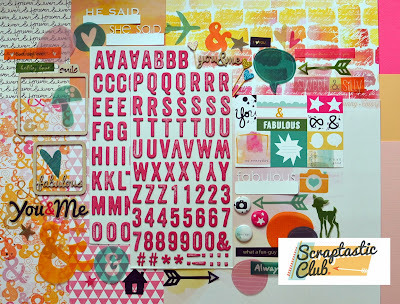 In addition to monthly kits, Scraptastic also has a great store filled with grab bags, flair, wood veneers, ink sprays and so much more ... great place to spend the $25 gift certificate that is up for grabs for this contest! 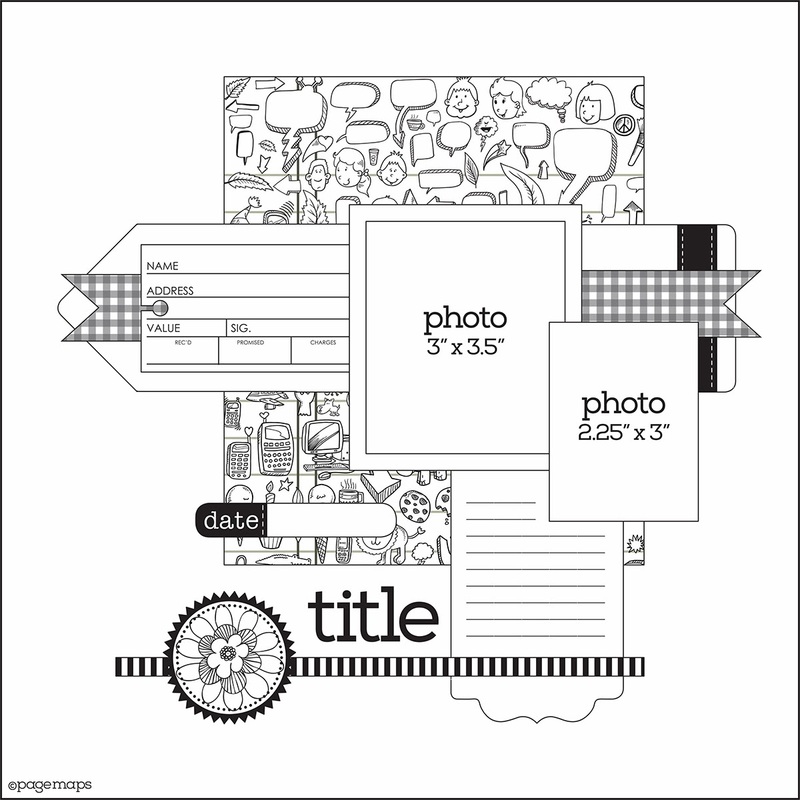 For your chance to win the gift card, create a layout based on this sketch, using any supplies you would like. Post a comment on this thread with a link to your entry. The contest starts today and ends at midnight, Sunday, January 26, 2014 (MST). This contest is open to everyone, everywhere! Another great sketch, and another great prize up for grabs! Will definitely get working on this one! Loved the reveal and this sketch is really great! Love it!!! I don't have a blog, how do I do it if I want to participate?? Thanks! Thanks for the sketch... here's a link to my layout. Here is the link to my layout based on the Page Map sketch. This was fun. I always love your sketches. I think this kit would be amazing to win. The colours fit into my style completely. Here's my link. Love, love, love this sketch! I had lots of fun playing with it! I created a layout using this gorgeous sketch. Thanks so much! I created a bright spring layout using this sketch! I needed some bright colors and flowers. Thanks for a wonderful sketch and inspiration, here's my page! Love the sketch....here is my take on it!!! Love the sketch! Catching up on some old photos! Thanks for the inspiration! Here's my digi version! This was fun! Love my scraptastic kits! What a nice sketch to work with! I needed an idea for this page, and your sketch was great! Here's my entry. Another great sketch. Here's my take on it. Here is my entry for this challenge! Great sketch, as always!!! When is Page Maps supposed to release the name of the winner, anyone know? Darn it, I'm late! I loved the sketch, anyway!! Design your greeting card is challenging work and best creativity, a good choice. Electronic cigarettes — battery-powered devices that deliver a fine spray of nicotine without any flame or VAPE — have been sold in this country for about three years now. Some people use them as a way to quit smoking real cigarettes. Unlike gum or patches, the devices mimic the sensation of smoking while providing the nicotine rush. We pride ourselves completely on our huge product range, wide scope selection of e-liquids and our customer service. We focus solely on providing the BEST products on the market coupled with both industry experts and a fantastic aftercare service. Vapedistrousa retails, discount and conveyance search for all vapor items, e-lquids, curls and batteries. Purchase Vape e fluid with best Vape kits.Vape juice is avaiable. Here are accessible alternatives for the different items about vape e fluid, vape kits, vaping equipment, electronic cigarette,vape, ejuice, ecig, vapor, smok or kangertech and yearn.